We have delivered a number of projects within Fulton House, a building that occupies a prime position on the Singleton campus and functions as the University’s social hub. The building dates from 1961 and is Grade 2 listed. Projects have been delivered in phases, with DarntonB3 preparing from the outset a strategic report to inform future phases of work. Due to the Grade 2 listing close liaison was required with the local Conservation Officer throughout. An initial phase addressed the issue that the building’s main façade suffered from many problems typical of a building of its period – wide temperature fluctuations causing discomfort and restricting usage; water penetration, high heat loss and poor appearance caused by difficulties in maintenance. The scheme posed several challenges for the project team. This included convincing the planning authorities to accept a complete replacement instead of a refurbishment of the original and to achieve Listed Building Consent within a compressed timescale. This was achieved by demonstrating the environmental and sustainability benefits of replacement and sensitivity to the original design intent. 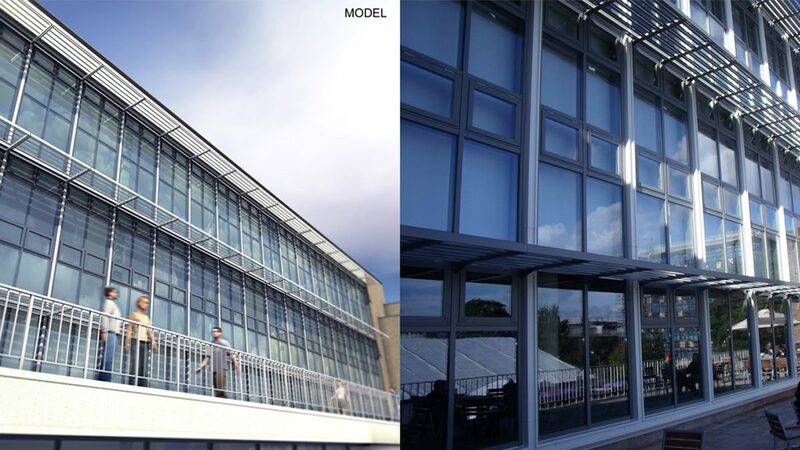 A combination of external sunshades and electrically operated windows linked to temperature sensors allows the south facing façade to react to external weather conditions. Electrically operated roller blinds control glare. 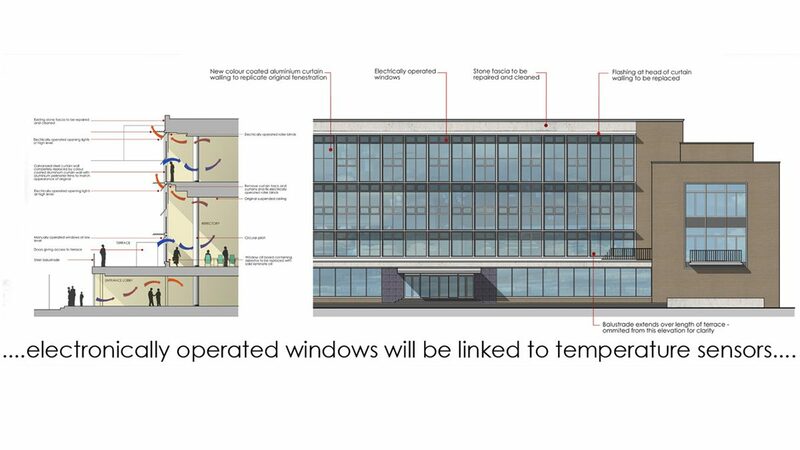 Careful planning was necessary to allow the façade to be replaced while allowing the internal spaces to operate continuously behind, including construction of full height weatherproof hoardings. Future Maintenance requirements addressed by contract with installer. 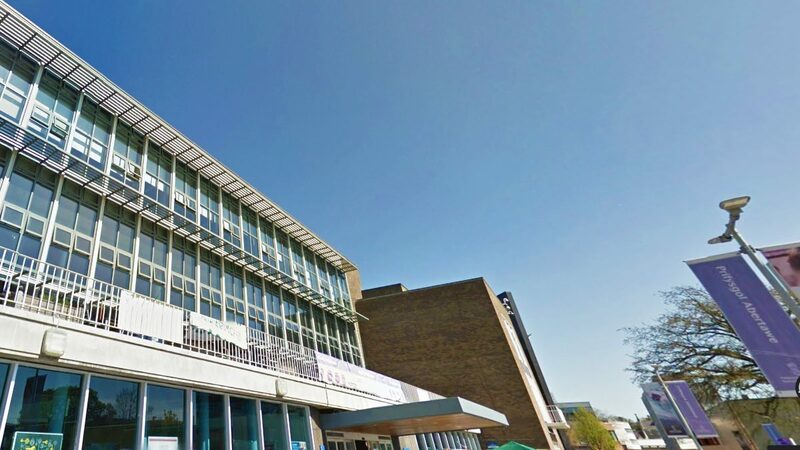 Further phases comprised creation of a new commercial area including supermarket, University shop, cafe and delivery area, new main toilets for the building, a new entrance area and reception, refurbished entrance canopy and refurbishment of the main circulation areas on the Ground floor. Former dining rooms have been converted to lecture theatres and seminar room spaces.